Kylie Jenner's favourite accessory is the most Googled in the world. Ever. | HELLO! It's official; everything Kylie Jenner touches turns to gold. Cartier gold, to be exact. Kylie's favourite jewellery – the Cartier Love bracelet – is the most Googled piece of designer bling. Ever. 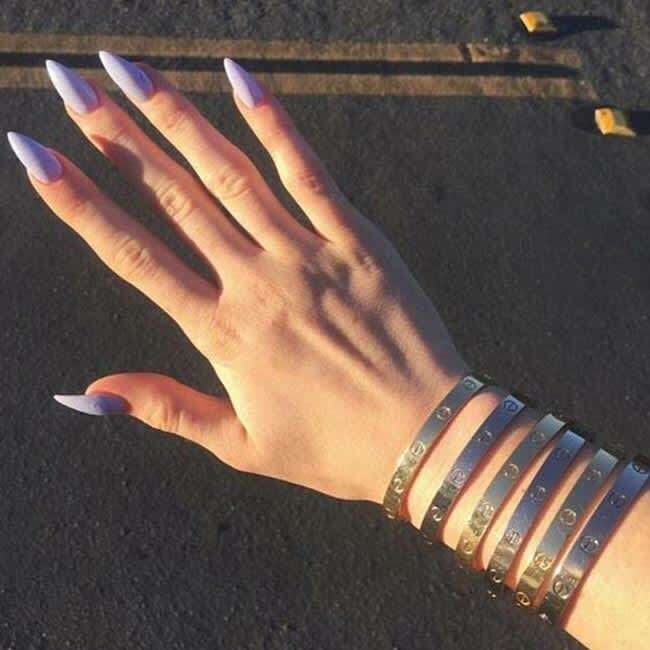 Kylie, 18, often shows off the expensive accessories, which retail anywhere between £1,150 and £31,000, on social media, and she's the proud owner of several of the Love bracelets, in yellow and white gold. According to Karus Chains, the celeb-favourite commands on average more than 353,000 search a month! It comes as no surprise Kylie is linked to the strong surge in popularity: the youngest Kardashian/Jenner sister has a huge social media following, and last year Time magazine named her one of the world's most influential teens. But if you're thinking of emulating Kylie's style and investing in a Cartier Love bracelet, be prepared to spend a lot of time with it. Earlier this year Kylie revealed she'd had one stuck on her wrist for four years. But we don't feel too sorry for Kylie. After all, there are much worst things to be locked into. Like handcuffs.